Point d’esprit (pronounced pwan deh-spree) is a finely woven net lace. 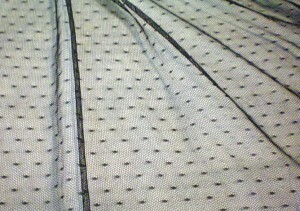 Most often found in black or cream, it resembles a soft tulle, but with dots woven into the mesh. Because it comes in full-size widths, it’s suitable for gowns, shawls, veils, and even formal curtains or tablecloths. 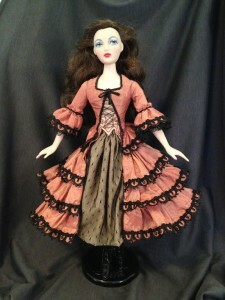 Its delicate nature also makes it ideal for custom doll clothes. Check the care instructions on the end of the bolt, but it can usually be hand washed and laid flat to dry. Use a pressing cloth and the lowest setting on your iron if you need to press it. Because of its inherent beauty, you probably don’t want to obscure this fabric with tucks or pleats. It’s fine enough that gathering will look good, but really, it can stand on its own without embellishment. Point d’esprit can be slippery and frustrating to work with, so take your time. Only cut one layer at a time, rather then folding your fabric in half and cutting double layers. It will be difficult, if not impossible, to undo your stitches, so baste by hand, then sew on the machine. Go slowly and double check every detail because you won’t get a second chance. You may need to experiment with using stabilizer and adjusting your sewing machine’s tension and stitch length. A zigzag stitch might work better than a straight-stitch, but play around with some samples first, to see what works for you. If you can, buy extra yardage. 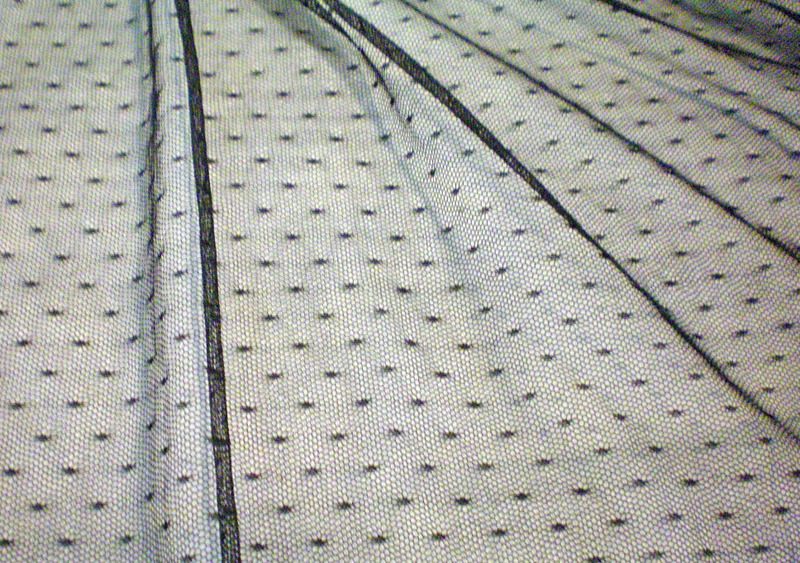 That way, you’ll have enough to experiment with to find the right settings on your machine, and you’ll be able to start over, should you accidentally ruin the fabric. Have you worked with point d’esprit lately? What tips or tricks would you suggest? 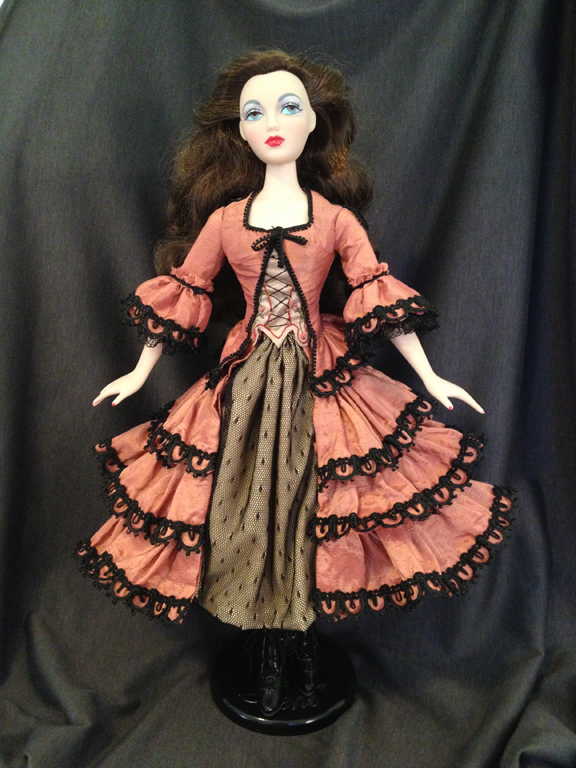 This entry was posted in Saturday's Stash and tagged Dolls, Fabric, Replica, Saturday, Victorian. Bookmark the permalink. That lace is amazing. Would you happen to know where i can buy lace just like that? Point d’esprit can be extremely hard to find. I’ve seen it on eBay, but only a few colors, and it’s usually quite expensive. ($50 and up per yard.) It does show up on Etsy for a more reasonable price, and in a lot of different colors, but always from sellers in China, which means you have an extra long shipping time. (Sometimes two months or longer!) I’m sure some of the more exclusive lace shops sell it, those that cater to bridal dressmakers, but I always use eBay or Etsy, myself. Try searching for “point d’esprit,” “dotted lace,” or “dot lace.” Hope you find what you’re looking for! Hello, I have been looking for lace like that. Do you know where I can purchase lace exactly like it?